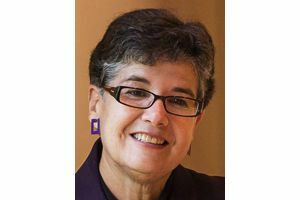 Now is a time in our country’s history when we must recommit ourselves to pushing the boulder of justice up the hill, for it is sliding back down with a momentum many of us thought was impossible, writes Ana Mari Cauce, University of Washington president, in an Op-Ed. I am a citizen of the United States not by birth but by choice. Although I came to this country at age 3, joining my parents who arrived as political refugees from Cuba, I was here as a permanent resident on a green card. I became eligible to apply for citizenship at the age of 18 in 1974, another difficult time in this country’s history. Military involvement in Vietnam was winding down, but we weren’t totally out of that country yet. The Watergate scandal was in full swing, and impeachment proceedings against President Nixon had begun. I was all too aware of this country’s shortcomings and that our leaders did not always act in ways that were admirable. So my decision to apply for citizenship was not taken lightly. Yet, I had also experienced this country at its best. My family’s life in Miami had its difficulties, but through hard work and sacrifice, my parents rebuilt a life that afforded my brother and me countless opportunities, including federal and state aid along with scholarships for college. Here, we also had the right to freely protest governmental decisions we disagreed with, and by the time I entered the University of Miami, I had joined in marches and sit-ins supporting change I believed in. Ana Mari Cauce is president of the University of Washington. When I raised my hand and took the oath swearing to “support and defend the Constitution and laws of the United States,” I did so with pride. That is why I am compelled to speak out now, in opposition to white nationalists, Nazis and the Ku Klux Klan, including those who marched recently on the University of Virginia campus and through Charlottesville. Their beliefs are beneath contempt, and their display of pure, unadulterated bigotry rejects values enshrined in our Constitution and its amendments. To stay silent would dishonor the oath I took when I entered adulthood. The televised images of the Klan and Nazis also evoked a very personal horror. They brought me back to another Saturday morning, almost 40 years ago, when members of these same groups murdered my brother, Cesar, then 25, in the Greensboro Massacre. He was a recent graduate of Duke University working as a labor organizer. My heart aches at the loss of Heather Heyer, the woman who was killed in Charlottesville, and of the two state police officers, H. Jay Cullen and Berke M.M. Bates, who died in the line of duty, as well as for their families and loved ones and the many who were injured. My hope is that beyond the pain, they find strength and inspiration. My brother was committed to justice and equity, and I recall a late-night conversation with him in which he talked about “the struggle.” He did not view justice as an endpoint, or a goal with a clear finish line. Justice, he said, was a constant work-in-progress. You pushed the boulder up the hill, it would inevitably slide back, and you would have to push it again. While the metaphor evokes Sisyphean futility, he did not believe the task was pointless or that progress was impossible. But he did believe you must stay vigilant and that more work is essential. So do I. Now is a time in our country’s history when we must recommit ourselves to pushing that boulder, for it is sliding back down with a momentum many of us thought was impossible. It’s no coincidence that white nationalists chose a college campus for their march; universities are vibrant communities committed to the free exchange of ideas, to building bridges not walls, and striving to become more diverse and inclusive. All of us, especially those of us on college campuses like UVA or the University of Washington, can and must work to move forward those values that we hold most dear. We must start by naming the problem, the racism that is part of our history and is still here, not only in the enraged faces of white nationalist marchers, but in our institutional and societal practices and in the bias, often unintended, which still affects people of color in this country. We must work together for solutions that address these deep-seated issues. And we must unite our voices in unambiguous condemnation of bigotry. 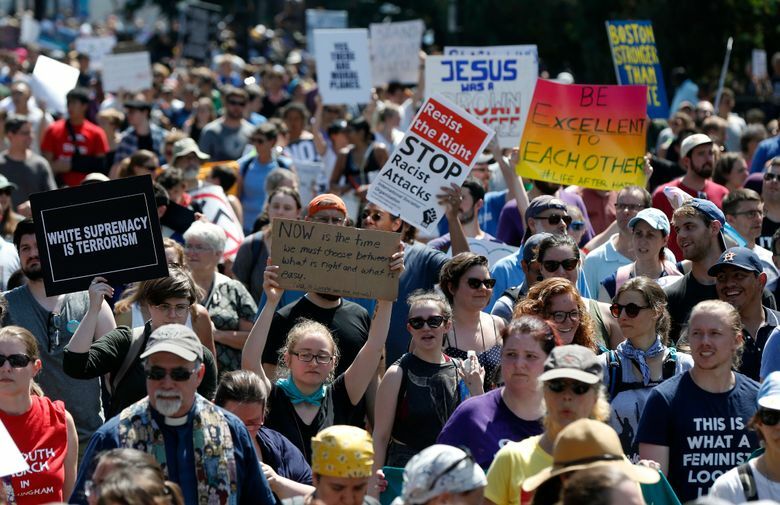 We know from the recent peaceful counter protest in Boston that our voices are louder — and more powerful — when we raise them together.